A cardiac event in your workplace can be devastating not only to the patient, but for the bystanders. CPR alone is not enough for a cardiac arrest victim. You need someone on site who can use the Automated External Defibrillator before the medics arrive. This simple to use device can truly increase survival rates when used by a trained bystander. 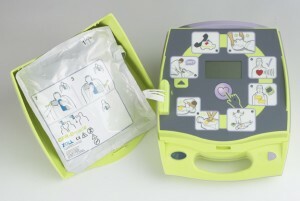 The good news is the prices are down for AEDS and the training is simple. For years the cost of AED’s were prohibitive for many of our clients. Currently, prices have fallen and many of our corporate customers now realize the due diligence in having this simple device in the workplace. Link to Life™ sells and trains on a variety of AEDS, and is offering a special price depending on the unit for under $1700 plus tax and shipping. Some AEDs include a 5 year warranty, 5 year batteries, 2 sets of pads (2 or 5 year shelf life), carrying case and accessories for patient care (training costs are extra). We can advise you on which unit is best for your workplace and budget. We have the experience and knowledge to help you make a better choice. Not all AED’s are created equal. Our four hour CPR/AED certification program ensures all staff can respond to a variety of cardiac emergencies. It also includes choking rescue review. Complete reference book for one year certification. If your staff has current adult cpr certification within the last six months we can offer a 2.5 hr AED only training program to them.